Lyme disease is one of the fastest growing infectious diseases in the United States and represents a significant public health concern. In recent months the CDC has reported estimates of Lyme disease infection in the United States to be approximately 300,000 per year, a rate that is 10 times greater than previously reported. Acute Lyme disease is underdiagnosed and undertreated, particularly in California, which has the highest rate of tick-born diseases in the western United States. This leads to high rates of morbidity from disseminated and chronic Lyme disease. Subsequently, there is a need for primary care doctors to recognize, diagnose and treat acute Lyme disease, which can be effectively treated with evidence based antimicrobial therapy. Jacob Leone, ND, a graduate of Bastyr University, has over seven years of experience practicing as an integrative primary care doctor with a specialty focus in complex chronic disease including Lyme and Multiple Systemic Infectious Disease Syndrome (MSIDS). He is also the medical director of two successful private healthcare practices in California. Dr. Leone served on the faculty of the American College of Traditional Chinese Medicine as part of their Core Faculty and has been a guest lecturer at the California Institute of Integral Studies and UCSF Medical School. He holds certifications in IV therapy including chelation and nutrient therapy and is an active member of several professional organizations including the CNDA, AANP, and the International Lyme Disease Society (ILADS). 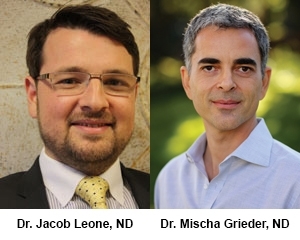 Mischa Grieder, ND offers both conventional and alternative therapies to patients seeking an integrative and scientific approach to health care. Since 2009, Dr. Grieder has worked with Dr. Steven J. Harris, M.D. at Pacific Frontier Medical, Redwood City, CA., where they focus solely on patients with tick-borne illnesses and associated chronic complex conditions. Dr. Grieder received his medical training at Bastyr University in Seattle, Washington. He is an active member of ILADS: the International Lyme and Associated Diseases Society. Additionally he has been adjunct faculty for biomedical sciences at the American College for Traditional Chinese Medicine in San Francisco for several years. This was arguably the best CME seminar that I have ever attended. The illustrations and very detailed information are very useful for reference. The flow chart for differential diagnosis is very useful for clinical practice. This was hard data and actionable advice, not conjectures or generalities. Thanks for the good work. The subject is hugely relevant. Great organization and overview of a challenging topic. Well done. Really appreciated the case studies. ​LOVED the protocols clearly presented and LOVED that brand names and dosages were given... this is super helpful. Both conventional and naturopathic treatment plans are listed for different situations. All the available medications are given with doses, safety and side effects management. The lab monitoring illustration is also very useful for clinical practice. Wonderful information. Great at teaching. The drugs were helpful and taught with great ease. I learned so much. This was the perfect webinar. The two doctors were spot on. Very enjoyable and organized!